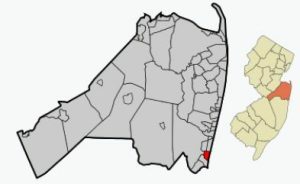 The Monmouth County town of Sea Girt had a population in 2010 of 1828 people living in homes in Sea Girt. According to the 2010 Census, there were 823 households. They had a median household income of $118,958. Many of the upscale Sea Girt homes for sale have water views or are waterfront. The low end of the price scale in this town is more than $500,00. In fact, recently Sea Girt homes for sale have actually closed for over $3 Million. Forbes Magazine ranked Sea Girt as # 197 in “America’s Most Expensive Zip Codes” in 2012. The beaches and the boardwalk in Sea Girt are open year round. During the summer season, daily or season badges are required for admission, and lifeguards will be on duty. The New Jersey State Police, the National Guard, and other law enforcement agencies operate a training facility on the Sea Girt beaches. Accordingly, select government employees and military are allowed to use this beach. Sea Girt is a popular destination because transportation to New York and other locations to the north are nearby at the Manasquan train station, which is on New Jersey Transit’s North Jersey Coast Line. The Sea Girt School District serves students in grades pre-kindergarten through eighth grades, and the enrollment is around 200 students. When Students go on to high school those students will attend Manasquan High School. Also, when students enter high school they may apply to one of the five high schools in the Monmouth County Vocational School District. Specialized courses are available in fields such as computer science, and biotechnology. Also courses in the medical and science fields are available, among others. Numerous private schools are also in the area.